[tweetmeme] Now that most nonprofits have a Community Page on Facebook in addition to their Official Page, it is crucial that nonprofits create a Wikipedia account to edit, maintain, and “Watch” their organization’s Wikipedia Page. Why? Because Facebook Community Pages have Wikipedia Tabs that pull in your organization’s information directly from Wikipedia. 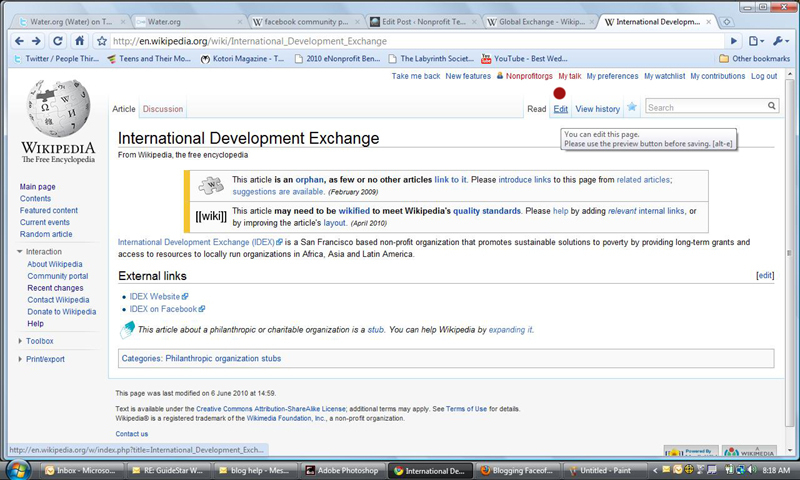 Notice how the Community Page has a Wikipedia Tab? It is worth noting that I personally “Like” Global Exchange’s Official Page on Facebook, so the Community Page did not come up in searches on Facebook. I had to login to my husband’s Facebook account (who does not “Like” their Official Page) to find Global Exchange’s Community Page. Facebook Community Pages do seem to trump Official Pages in searches on Facebook. Given that most nonprofits now have a Community Page that supersedes their Official Page in Facebook searches, and those Community Pages pull in information from Wikipedia, can you see why it is now very important to edit, maintain, and watch your organization’s Wikipedia Page? 1. 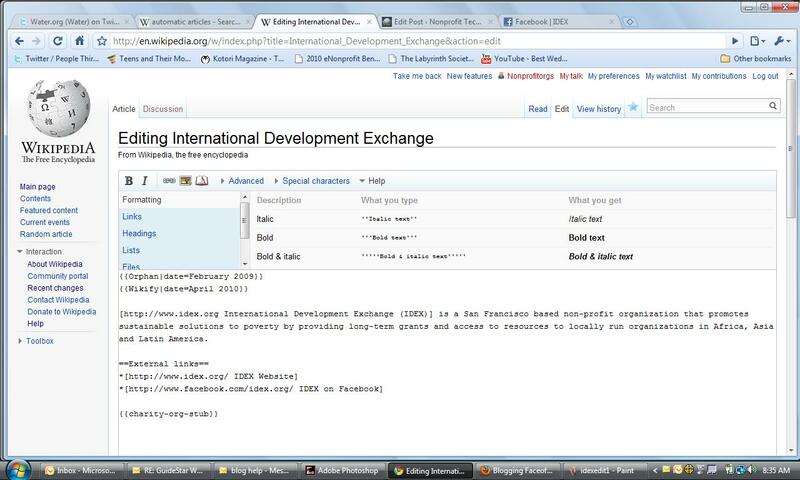 Create a Wikipedia account. It’s free, takes only a few seconds, and has many benefits. 2. 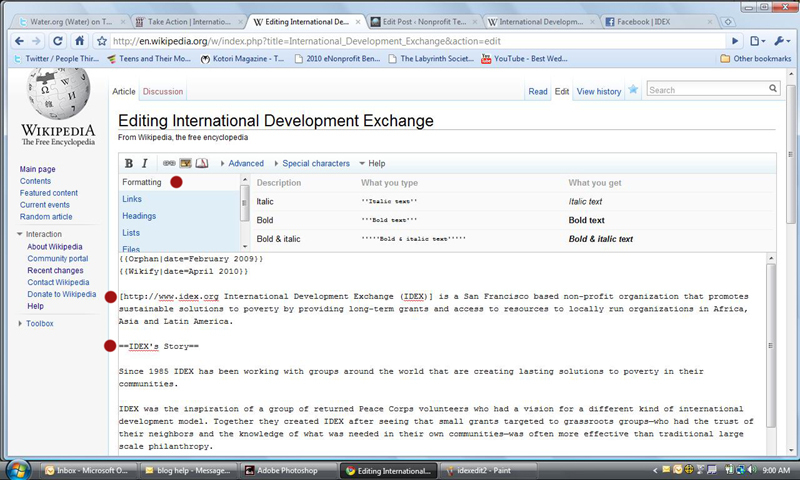 Search for your organization on Wikipedia. If your organization does not have a Wikipedia Page [also known as articles], then your new Wikipedia account allows you to create one. If your organization does have a Wikipedia Page, then you may want to edit the content (with caution). Please note that edits made on Wikipedia take 24 hours to appear on your organization’s Facebook Community Page. Notice the ability to suggest a relevant Wikipedia Page? 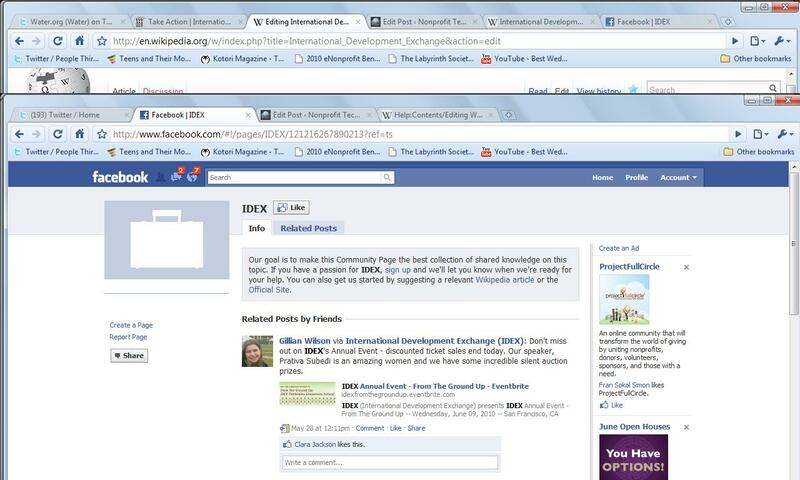 I did that for “IDEX”, but if International Development Exchange had named their Official Page “International Development Exchange” instead of “International Development Exchange (IDEX)” then they would have a Community Page named “International Development Exchange” with a Wikipedia Tab from the “International Development Exchange” Wikipedia Page. 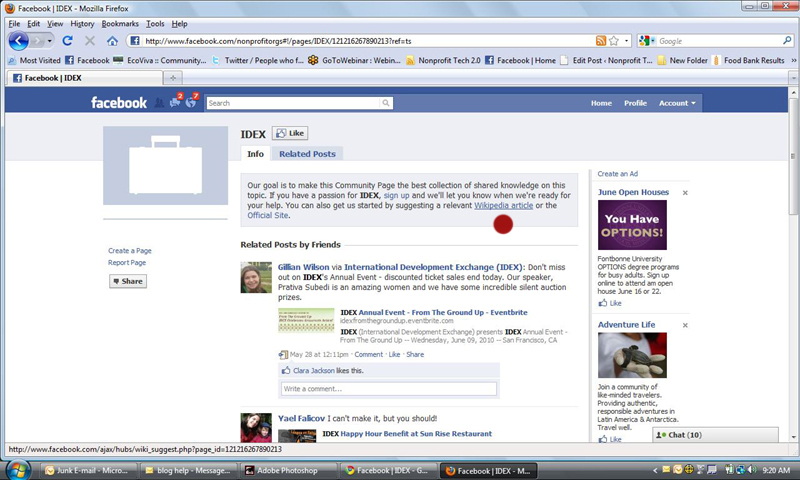 The IDEX acronym altered the way Facebook created a Community Page for IDEX. Confused? You’re not alone. Community Pages are confusing… and at the current time I think rather useless. Hopefully as time goes by Facebook will explain better why they created them in the first place and enhance their usefulness. All that said and Facebook confusion aside, odds are your nonprofit has a Facebook Community Page. Find it and then sign up to edit your Wikipedia Page. Wikipedia has unique editing code and guidelines. Depending on your skill set, it could take a couple of hours to figure it out. You can do basic edits or get really advanced with your Wikipedia Page – like the Humane Society of the United States. Here’s how it looks on the HSUS Facebook Community Page. They don’t want you to create duplicate Pages for marketing purposes a.k.a. a conflict of interest. Makes sense if they are going to integrate fully into Facebook via Community Pages. Where did you find the “strongly discouraged” from creating or updating their own page? This article is totally wrong. I went through the whole process and then Wikipedia blocked the page as a violation of their conflict of interest policy and non promotion policy. I advise that you not waste your time. The article is correct. Nonprofits can update their Wikipedia pages, but as I mentioned in the article, do it with caution and I linked to their policy. Now, in most cases, this is interpreted as “don’t edit your organization’s Wikipedia page”, and that’s not an entirely bad option. A strictly-best-practices approach is to only edit the discussion page for your article, to suggest edits that others ought to make. Strictly speaking, however, you can edit. Rather, it’s that if you want to edit your organization’s Wikipedia page, you ought to follow some strict rules. First, be *very* transparent about who you are. Your account should be managed by a single real person, and the account’s user page should explain who they are, that they work for the organization, and their purpose in doing so. Second, stick strictly to factual, neutral information. Fixing errors and updating information is fine, but you need to watch out that you are not using Wikipedia to market your organization. In particular, avoid promotional statements disguised as statements of fact, e.g. “Nonprofit X is a leading XYZ nonprofit” or “Nonprofit X has helped hundreds/thousands of people with problem XYZ”. If in doubt, find a reliable source *independent* of your organization that verifies the facts, and cite it in the article (I suggest checking out http://enwp.org/WP:FOOT for details). Third, work with people who come forward with criticism. If someone says “This edit to the XYZ article was inappropriate”, your responsibility is to say “OK, what would be a better course of action?” rather than simply trying something else. Engage in discussion, and be open to suggestions, and you’ll have far fewer issues come up. The danger in editing with a conflict of interest is that one’s edits can be seen as promotional, and Wikipedia’s editors are *very strict* about booting promotional activity off the site. Don’t let a lack of transparency, of good practices, et cetera cause you a problem if you’re going to edit. Great advice. Thanks. Sourced it in the article under Step 2 – “with caution”. Heather, good post. Do you know how we can remove our organization’s logo from its created Facebook Community page? thanks for the info. webinars are the future! If I do go ahead and submit one (with full transparency and caution), is it better to submit one from an account created with my personal work email address, or a general email address for the organization?